Ducks 2, Opps 0 — Bring on the Cowboys! As exciting as this time of year always is, 2014 is going to be special for more reasons than one. The Ducks boast one of the most talented rosters in school history, headlined by seniors Marcus Mariota, Hroniss Grasu and Ifo Ekpre-Olomu, the myth of SEC “superiority” is officially in jeopardy, the College Football Playoff system has finally arrived, and the Ducks have shed their “soft-and-gimmicky” label by blowing past a top-tier Michigan State team. 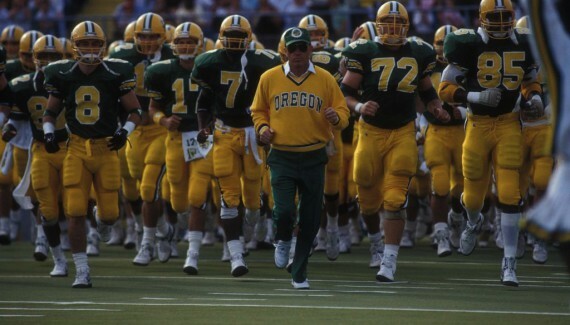 On top of all this, Duck fans have another reason to rejoice – This season marks the 20th anniversary of the 1994 season, a heroic campaign culminating in the school’s first trip to the Rose Bowl in 37 years. It was the year that, in many ways, was a turning point in the program’s history. The 1994 season included wins over ranked conference opponents USC, Arizona and, of course, Washington, featuring cornerback Kenny Wheaton’s legendary pick-six in the final minutes of the game to bury the Huskies. 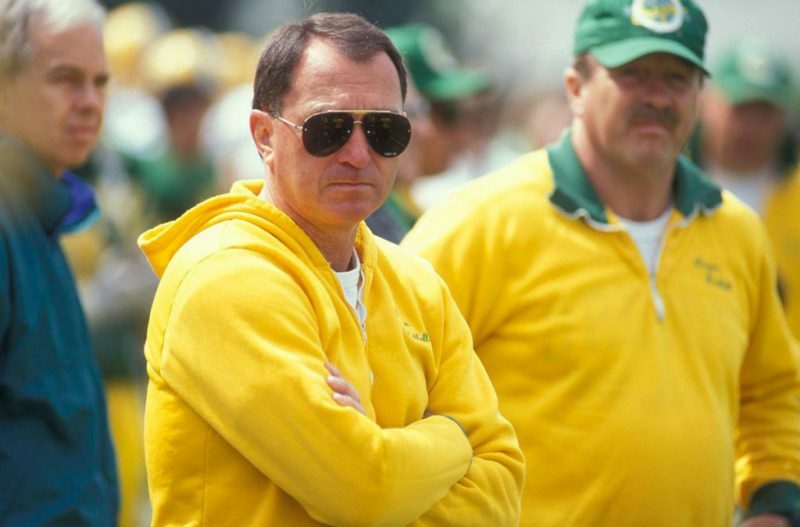 Under head coach Rich Brooks, the Oregon Ducks emerged as a true national power in 1994, and ascended to a level of greatness in college football that they have yet to leave. The momentum created by this squad 20 years ago is directly related to the elite level of success the program has had over the past few seasons. And while the ’94 season was a tremendous journey and overwhelming success, it was not exactly expected before the campaign kicked off. In 1992 and 1993, the Ducks went 6-6 and 5-6, respectively. 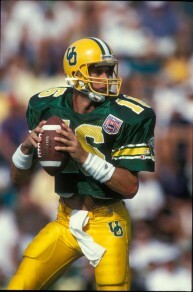 The 1993 season was especially tough, the most notable loss coming when Oregon blew a 31-0 lead over Cal to lose 42-41. After their collapse against the Golden Bears, the Ducks lost five of their final seven games, and finished with a losing record that made many of the coaches, most of all Brooks, fear for their jobs. That anxiety did not subside throughout the first three weeks of the 1994 season. In fact, it only got worse. After cruising to a 58-16 home victory over Portland State, the Ducks headed to the Pacific to take on Hawaii, a team that ended up finishing the previous season with a 3-8-1 record. The Ducks did not quite look like themselves throughout the entire first half, and failed to reach the end zone until the beginning of the third quarter, when running back Ricky Whittle barged in for a one-yard score. By then, the Rainbow Warriors held a 20-10 lead, and Oregon did not score again until there was only 3:36 left in the game. With Hawaii leading 36-10, backup quarterback Tony Graziani, in for fourth-year starter Danny O’Neil, hit wide out Cristin McLemore in the back corner of the end zone. The Ducks failed on a two-point conversion, and headed back to the mainland with an ugly loss. If there was a bright side to that loss, however, Duck fans got a glimpse of two future stars. Freshman receiver Patrick Johnson recorded his first career reception, and fellow freshman Wheaton picked off his first pass – though it was negated due to a penalty. The loss was a tough one, but at least – by itself – it was possible to shrug off as ‘working-out-the-early-season-kinks-or-road-game’ jitters. But Oregon hosted Utah the next week, and things did not exactly improve. At the time, the matchup with the Utes appeared to be an average game featuring two programs attempting to escape mediocrity. In retrospect, however, it was one of the best games of the 1994 season. On top of the Ducks’ eventual success, Utah finished the season at 10-2 after winning its first eight games, and in fact Utah’s only two losses were by one score. On this September day in Eugene, the Utes diced up the Oregon secondary. Quarterback Mike McCoy completed 71 percent of his passes for over 300 yards and a pair of scores. Utah found success in nontraditional ways, scoring on a fake field goal and an interception return on its way to a 34-16 victory. The Ducks were unable to take advantage of the Utes’ four turnovers and numerous penalties, stumbling into conference play with two preseason losses. Oregon’s next game was on the road against a ranked USC Trojans squad, and Brooks needed a way to turn the tide. O’Neil was sidelined with a finger injury and was not able to make the trip. With his starting quarterback out and two losses already on the young season, Brooks’ job was in serious jeopardy. He took his team down to Los Angeles for a pivotal conference opening matchup in hopes of turning things around. Duck fans would soon find out that matchup would not only turn the 1994 season around, but it would also change the course of the entire program.